ZYX isn't exactly the most forthcoming company in the world on the subject of itself – its website is 'under construction', hence their website goes to its Japanese exporter. Its printed instructions and publicity don't give much away either – but its reputation as a high-end cartridge manufacturer is enviable. The range is quite wide and a little confusing, simplified somewhat by UK importer GT Audio, which carries just seven models. The R100 Yatra sits in the middle of that range. 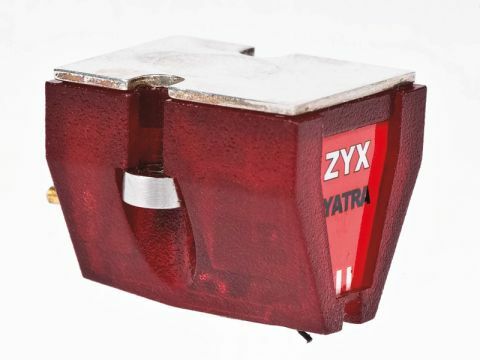 At first sight, the R100 Yatra cartridge looks fairly typical – 'micro ridge' stylus (one of countless variations on the general theme of line contact), boron cantilever of typical length, low-impedance generator with an output on the lowish side, and a robust, non-resonant plastic body. But it's clear that some unusual thinking has contributed to its design. An article by designer Mr Nakatsuka, reproduced in the instructions, lists several criteria he considered, not all of which are obvious and some of which are downright arcane. For instance, it's usually assumed that the metallic parts of a cartridge will be grounded somehow, but he separates out the various parts (body, yoke, magnet etc) and suggests that a non-metallic body is the best way to deal with the electrical issues arising. Even the direction in which the winding wire was drawn is taken into account, but then plenty of audio cable manufacturers have been considering this for years, so perhaps that's not so surprising. These points, plus the unusual winding arrangement of the coils, lead to what ZYX calls 'Real Stereo'. The plastic body helps keep the mass of this cartridge quite low at five grams, and the lowish compliance means that arm/cartridge resonance in a lightweight arm could be rather higher than ideal. Tracking force is recommended at two grams, but with quite a wide permissible range of 1.7-2.5 grams. This seemed to be one of the fussiest as regards setup, and tracking force is particularly sensitive: we ended up at 2.3 grams in one deck and 2.4 in another, with the arm base a little lower than average. We also distinctly preferred the sound with a good transformer in circuit, rather than a direct high-gain phono stage. Once that was done, though, we had some very good results from this cartridge across the board. Or almost; try as we might, we just couldn't get it to track some of our 'hottest' LPs convincingly. But short of that, it is very capable. More than anything else, it is an exceptionally dynamic cartridge. We haven't mentioned this aspect in relation to any of the others as there doesn't seem a huge amount to choose between them – they're all basically good. But this one really leaps out as revelling in huge dynamic swings. It may actually be that it's a little exaggerated, frankly, but it's just so enjoyable that you don't worry about that possibility. With any music from solo piano to grand rock – The Wall being one smile-inducing example – the sound really leaps out at you in sudden climaxes. At the same time there's plenty of detail and frequency range extension on offer and the timing is good too. It doesn't necessarily follow that timing and dynamics go together, though they often do. And if we're honest, we'd say that the Yatra seems a little better at the big scale dynamics than the finer dynamic details that go to make up great timing, but you can still tap a foot to this cartridge without the slightest mental effort. Melodic music is well served too, though there's sometimes a sense that the sound is straining to do something more exciting. As a question of taste, this is almost the opposite extreme to the van den Hul MC10, but it's certainly a fine little transducer.